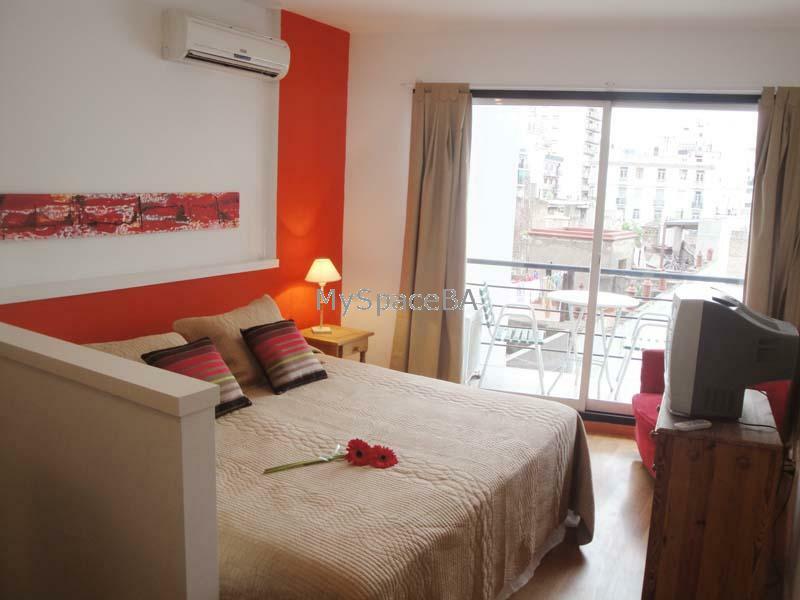 Lovely, bright and very quiet one room apartment located in Abasto district, very well know area due the Abasto Shopping Mall and Carlos Gardel , famous Tango singer who died in 1935 . The Studio is situated at the back of this brand new building far away from the noisy trafic . It offers a dinning area with an open plan kitchen . Closet . Bedroom area with a King size bed which can be split in to two large beds. Aircon cold / warm . TV with cable , Internet High Speed . Wi Fi . Bathroom with shower . Balcony . Lovely balcony . Aircon cold / warm . Wi Fi . Cell phone . TV with cable . Safe Box . Iron . Hair dryer . Kitchen with stove , dishes , toaster , coffe-machine . Refrigerator . Electrical oven . Hair dryer . Bedlinen and towels. Brand new building . Elevators . Swimming pool for summer season . BBQ area . Laundry . Subway just 150metres away. Bus Routes . Carlos Gardel Museum . Abasto Shopping Mall . Tango Shoes Shop . Restaurants . Bars . Downtown . Banks . Residential area . Comercial area. Universities . Church . etc.